This film follows a 20-year-old Senegalese man named Tauw who searches for work and tries to support his pregnant girlfriend. His younger brother Ouman has troubles of his own involving the religious nature of his school. These two brothers ultimately must cope with a society in a state of change and uncertainty. Brunette, Peter. 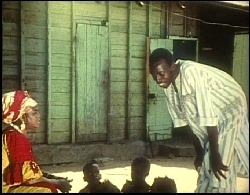 Ousmane Sembene: Interviews. University of Mississippi Press, 2008. pg 31. Print.